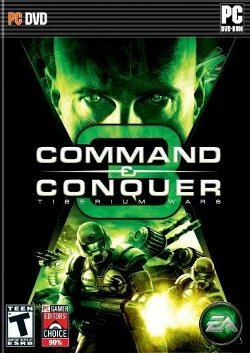 Command & Conquer 3: Tiberium Wars is the most recent addition to the Command and Conquer franchise, developed and distributed by Electronic Arts. It is a futuristic real-time strategy game that takes place on Earth, infested with a green (occasionally blue) alien substance known as Tiberium, which is changing the Earth at an extraordinary rate. It is highly praised and it leads the Command and Conquer franchise back to its roots - the previous installment of Command and Conquer - Generals, and its expansion pack Zero Hour - both occur in real-time earth with no mention of either of the two previous universes (Red Alert or Tiberian) and has a different gameplay style altogether. C&C3 sees the return of Tiberium, the sidebar, Harvesters, and various other C&C-specific units such as the Mammoth Tank. The latest expansion pack is Command & Conquer 3: Kane's Wrath. Gameplay is hardly realistic - buildings seemingly come out of the ground and a certain unit - the MCV - literally transforms into a massive working structure called the Construction Yard. Regardless, the gameplay is relatively easy to learn and is highly praised by major reviewers. Tiberium is the only resource players will need to collect. It is harvested by slow-moving yet highly resilient vehicles called Harvesters (see the list of units). Tiberium spreads from Tiberium-filled chasms, which slowly regenerate the field they are tied to, providing players with an unlimited amount of it. It may take a while, however, for the fields to regenerate once depleted. Tiberium will also produce more Tiberium nearby, but at an extremely slow rate. Command and Conquer 3 is also notable for its real-time FMVs, which feature famous Hollywood actors and actresses including Grace Park, Michael Ironside, and Billy D. Williams. Joseph D. Kucan also reprises his role of Kane, an enigmatic yet extremely cunning and brilliant man who leads the Brotherhood of Nod. There are three primary factions in the game, each one with a different perspective on Tiberium. The newest addition is the Scrin, which have been alluded to in previous installments of the C&C franchise. The Global Defense Initiative represents a typical western military. The GDI sports quite expensive and heavy material, and are generally considered the conservatives - they stick to what they know and prefer tried and true methods of combat versus the new and radical. Their strengths lie primarily in the middle game, where they can take full advantage of their heavy hitters. The Brotherhood of Nod are the underdogs. Led by Kane, their units fall under two general archetypes - fast, light units, or highly experimental tough units. They are unafraid to die for their cause, and most worship Kane as the Messiah. The Scrin is the newest faction, and intend to use Ichor (what they call Tiberium) for their own malicious purposes. They field powerful infantry and tough vehicles, and often use massive fleets of aircraft like Planetary Assault Carriers and Devastator Warships to destroy their foes. Several patches have been released, the newest being Version 1.09. The earlier patches fix primarily connectivity issues as well as downgrading the less strategy-oriented "strategies" (putting more emphasis on economy rather than overpowering units) and as such updating is highly encouraged. The Battlecast Viewer was recently released and it allows players to view matches online as though they had the game - it contains all the unit models, but none of the functionality. Battlecast Primetime is a flagship internet TV programme which covers the latest news in the Command and Conquer community. They also broadcast five matches out of the ones that have been "battlecasted" (having the Battlecast option turned on) to show to the community. Two other supporting shows include Aftermath and Command School. Aftermath features a behind-the-scenes look on the production of Battlecast Primetime, including miscellaneous items like bloopers. Command School outlines tips, tactics, and strategies employed by players and cover things like build orders and unit matchups. Germany in particular seems to be grasping Command and Conquer 3, while a handful of top ranked players, including the infamous Dackel, hail from the UK. The game was featured in the World Cybergames Championships, which "Apollo" ended up winning.